Bora Bora is an island that is a part of French Polynesia. 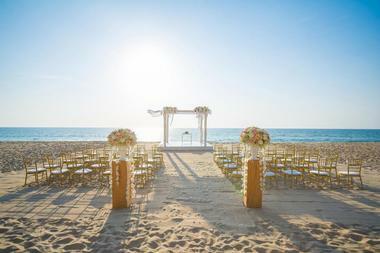 It is a very popular tourist destination especially among honeymooners. The peak season runs from May to October - the weather is warm, there is very little rainfall, but there are many visitors during this time of year, so make sure to book your accommodations well in advance. April and November are good times to visit Bora Bora - the weather is perfect and there are less visitors during these two months. Low season is between December and March; the weather is wet and while there are fewer visitors, there are mosquitoes. January greets the beautiful locale of Bora Bora with warm and rainy weather. Precipitation averages are high at 12 inches (310 mm). The average high temperature peaks at 87°F (30°C) while the average low temperature hovers at 76°F (24°C). Bora Bora Weather in February: The weather remains warm in February with the high temperature averages remaining at 87°F (30°C). On the other hand, the average low temperature decreases by a small amount to 76°F (24°C). In March, the low temperature average returns to 76°F (24°C). The high temperature average stays at 87°F (31°C). April sees a decrease in precipitation rates with expected rainfall at a moderate level of 5 inches (138 mm). Meanwhile, the average low and average high temperatures remain the same at 76°F (24°C) and 87°F (31°C). Bora Bora Weather in May: There’s little change in Bora Bora’s weather in May, with very minimal downward shifts in the temperature. The average low and the average high temperature measure in at 75°F (24°C) and 86°F (30°C) respectively. In June, the temperatures continue their downward trend with the high temperature average decreasing to 84°F (29°C). Similarly, the low temperature average decreases by a few degrees to 73°F (23°C). July sees the average low temperature hold steady at 73°F (23°C). The average high temperature, likewise, remains the same at 84°F (29°C). July is the driest month of the year with the precipitation averages at 3 inches (77 mm). 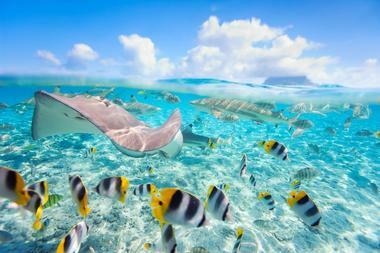 Bora Bora Weather in August: The coldest month of the year comes in August with the average high temperature at 83°F (29°C) - the lowest for the year. Meanwhile, the average low temperature stays the same at 73°F (23°C). In September, the average high temperature returns to 84°F (29°C) while the precipitation average increases to 4 inches (104 mm). Low temperatures remain the same. October sees the temperatures begin to rise again as the high temperature average creeps up to 85°F (30°C). The low temperature average increases by the same amount to 74°F (23°C). 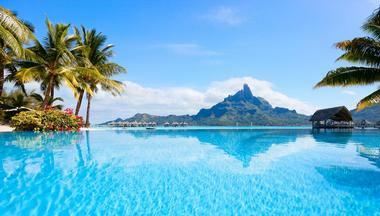 Bora Bora Weather in November: The average high temperature remains the same in November at 85°F (30°C). On the other hand, the average low temperature increases to 75°F (24°C). In December, Bora Bora receives the largest amount of rainfall annually as precipitation rates shoot up to 14 inches (342 mm). While the average low temperature holds steady at 75°F (24°C), the average high temperature sees another small increase to 86°F (30°C). Bora Bora is a beautiful destination to visit with the best time to visit is generally between the months of November and April. If you wish to visit Bora Bora when the temperature and climate is at its absolute best, plan your visit anytime between March through October. To avoid the thousands of tourists that hit Bora Bora’s beaches, it’s best to come in November, which, coincidentally, is also when the Hawaiki Nui Va’a festival takes place. For the best of all elements of a vacation such as tourist density, temperature and prices, plan your visit in April. Most people arrive in French Polynesia at the Faaa International Airport in Papeete, the capital city located on the famous island of Tahiti. From this airport visitors can fly on any of the frequent Air Tahiti flights, a short 45 minute ride to Bora Bora. Most people arrive in French Polynesia at the Faaa International Airport in Papeete, the capital city located on the famous island of Tahiti. From this airport visitors can fly on any of the frequent Air Tahiti flights, a short 45 minute ride to Bora Bora. Once you have arrived, there are several ways to get around Bora Bora. Cycling is by far the easiest and most popular way to do this. The island is small: it only takes four hours to cycle around the entire island. 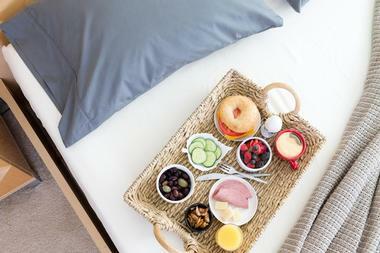 Some resorts offer complimentary bicycles while others charge minimum fees. Riding a bicycle gives visitors an opportunity to see the beauty of Bora Bora close up. Rental cars are also available but they are quite expensive. There is a local bus system called Le Truck but it is known for being very unreliable. 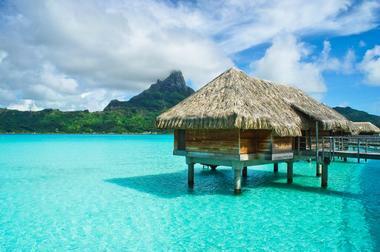 Taxis are also available on Bora Bora but they are notoriously expensive. The food served at the resort restaurants is world-class: the food is almost as famous as the island itself! The restaurants at each of the ten or so resorts offer stunning views of the lagoon and offer fresh seafood and other tasty choices. For those who want to try restaurants outside of the resorts, there are several areas to explore: Vaitape Village, Matira on the southern end of the island, and Povai Bay on the southwest coast. For visitors interested in shopping, many of the resorts have their own specialty boutiques. Otherwise head for Vaitape Village where you’ll find souvenir shops and black pearl jewelry. 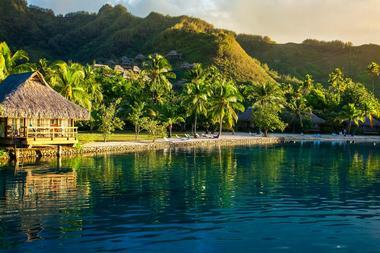 Bora Bora is home to some of the most spectacular resorts in the world: no wonder they are so frequently photographed. 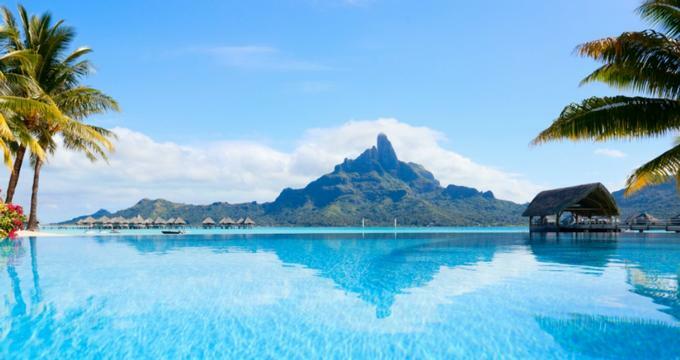 The most famous resorts are those with bungalows suspended over the crystal clear waters of the lagoon: some of these luxury properties include the Four Seasons Resort Bora Bora, the Hilton Bora Bora Nui Resort and Spa, the InterContinental Bora Bora Resort and Thalasso Spa, Le Meridien Bora Bora, and others. But there are less expensive options on the island. There are small hotels, family-oriented hotels, and vacation rentals such as Tahiti Homes, Tahiti in Style, and Tahiti Villas.